Mysliveček, il divino Boemo (the title seems to have been a fictional exaggeration) was particularly associated with opera. But his instrumental works outnumber the operatic by some margin and some of his best-known works, to us at least, are his concertos. The years of his greatest triumphs were between about 1767 and 1777, a decade that saw foreign successes, meetings with Mozart and considerable operatic esteem. His Six Symphonies of 1772 are indebted to the Italianate three-movement form, which they have absorbed with considerable vivacity, and they show individual touches � modulations, wind solos and the like � that give them an individual stamp. It helps that they are played by L�Orfeo Barockorchester with a sense of uplifting incisiveness; try the powerful and buoyant horns in the finale of No. 3 in F major, full of strong accents and alive. Or the graceful cantabile of the slow movement of No. 5 in B flat major with its well-balanced flute writing. Certainly the Bohemian knew how to compress melodic strands in these works as in the Siciliano of No.6 which is free flowing and Elysian. He exploited other, earthier sonorities as well and was not averse to embodying hurdy gurdy frolics in the Allegro assai of No.4. What remains paramount however even in these small scale works � only one lasts above ten minutes in these performances � is the exemplary string writing and the way his five part textures embolden the gallant cast of, most remarkably, the Andante of the Second Symphony, in A major. Coupled with these Symphonies are the Opera Overtures written on the same three movement basis and sharing something of the Symphonies� qualities. Here though Mysliveček can ingratiate a contemporary fad or two � such as the trumpet overture of Il Demetrio with its crisp and warlike finale or the affecting slow movement of Romolo ed Ersilia. One feels the greatest weight of concision, of operatic compression, in the tremendous Andante from � ironically � the Symphony Op.1 No.5, which is contained in the second disc otherwise given over completely to the opera overtures. To round off this sensitive and invaluable disc, played with care and imagination by this original instrument group we have some helpful notes and a crisp acoustic � not too chill, not too reverberant. 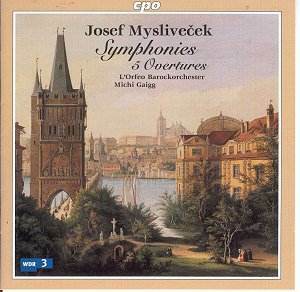 Mysliveček was certainly no trailblazer with these works but they are nevertheless excellently crafted examples of the genre.